A recap of a three night stay in New York City that had us hitting the jazz clubs each night. This show features some of the great artists we saw during our stay. The Mingus Big Band was just a rollicking good time with smoking arrangements and soloists. Next up was Mike Stern rocking out in a trio setting at 55Bar, one of my favorite venues. The final night in NYC we caught Johnathan Blake's CD release party at the Jazz Gallery. We finish the podcast with a beautiful composition and arrangement by Maria Schnieder. Fat Tuesday is this week down in N'orleans, and that begins the Mardi Gras celebration. This podcast features great New Orleans music from jazz artists young and old. Tunes from the Rebirth Brass Band, Louis Armstrong, the Marsalis Family, Terrance Blanchard, Skerik and a new sax player Khris Royal will get you in the groove for this year's Mardi Gras. Norleans ~ Doctor Lonnie Smith ~ Too Damn Hot! This pre-Valentines Day special features jazz tunes inspired by LOVE. Not a lot of typical sappy love songs in this set, but some hard-driving emotional compositions. We start with some a great tunes from the 50's performed by Jackie McLean and Lester Young, eventually breaking out into newer ground, with some soulful music by Mulgrew Miller, Aretha Franklin and Kevin Mahogany. We switch over to some fusion guitar with Mike Stern and Joe Beck. We finish this lovely show with one of my favorite romantic jazz ballads by Jimmy Greene entitled Love In Action. 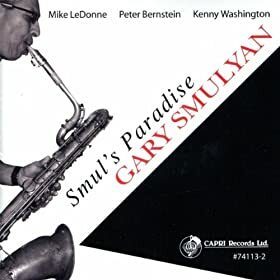 After kicking off this podcast with a straight ahead jazz romp from Steve Davis, we get into a solid groove from a new release by baritone sax master Gary Smulyan. Art Pepper follows with some cool jazz grooves. We then move to a different kind of swing with some African rhythms from Omar Sosa. Ahmad Jamal serenades us on three tracks with his piano trios. We finish up with Josh Evans cooking on trumpet from his debut album Profile.